An opportunity to examine your own views on the martial philosophies of others. Beware becoming a prisoner of other people's thoughts and words ... examine carefully for your self. Never underestimate the part that your mind can play in your own success .... or failure. Belief gives birth to power. Mind is everything, your mind generates energy and spirit. There are many that struggle to the edge of the tatami but when their foot touches it, they are transformed . . . this is spirit. "You may well be able to put your mind where you will . . . but you'll not be able to leave it there." Ivor. Can this be the ‘magic’ in Aikido? Why do we bow to O-Sensei ? O-Sensei’s poems, what do they mean to you? On the benefits of workshops and courses. 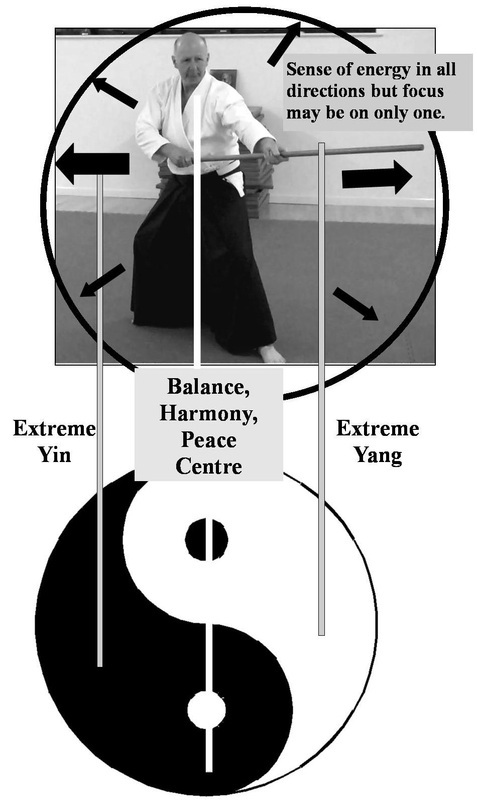 Qualities possible from martial arts practice. A principle that weapon’s practice supports. Let wisdom be the hero for the day. Ki, extension and relaxation = power. Several short references to Ki and power. It’s a little known but natural phenomenon called the ‘ideomotor effect’ and has been written about before with regard to aikido, particularly in relationship to ki power. Simply put, muscles in the body join in with a person’s will or belief without informing that person they have done so. The person will be unaware that the muscles engaged, in fact they might even argue that they were relaxed at the time – they will not be aware of the underlying muscle involvement. This is what I think she is doing; this is my understanding . . . as the knees bend and begin closure, her mind is doing the opposite, it is telling the knees to open. This in turn will trigger the ideomotor effect and bring muscles into play which balance the posture – balanced = no strain. We tend to think, the mind is doing it, but the mind is triggering muscles to act on your behalf without knowingly engaging them. This is one of the reasons we should at least look at other styles of Aikido. Take Ki Aikido or at least Koichi Tohei's view on it. There may be many teachers out there who do not commonly practise 'ki exercises', perhaps don't even know about them! Here I've taken a picture from Aikido in Daily Life showing thumb and finger held together, once by physical and known strength and the other relaxed but using mind power. The object of the exercise is to see which remains intact after a partner tries to pull them apart. By imagining (believing) that the fingers make an iron ring they prove the most powerful. Power without effort. How do you think the ‘unbendable arm’ exercise works? We never really question it, because it is the magic ingredient ‘ki’ isn’t it? Well perhaps it is in a way. The better your mind is trained in channelling belief the better, the more relaxed your muscles the easier energy can flow. Success in the practice breeds more belief and therefore greater success . . . but we continue to feel no physical feed back – in fact we feel even less. The big guy falls over and you wonder why he did, as you hadn’t put any physical effort into the technique yet ! What about the age old story of the woman who lifts a car to save a child, yet afterwards cannot explain how; In such a case, instinctive and long hidden nature kicks in, maternal instinct, adrenalin and unity of mind, body and spirit combine with an unbreakable intent to achieve – simple as that. That’s why we can’t do it in ordinary life – because of how we are educated to grow up (eg, ‘sit up straight! ), nothing is connected up properly and our mind interferes with our true ability and causes doubt to act against our hidden powers. Don’t do it, but you could go outside and try and lift your car now . . . doubt has already defeated you as you walk to the door. The martial arts are a pathway to change all that. The ideomotor effect also throws light on how another can detect your intentions. Hiding what you intend to do requires some skill and practise. Remember, almost imperceptible muscle movements will occur the moment you create mind intent. Ever wondered why some people have 'seen' your attack coming so early that your attack has to follow and try and catch up – leading to your downfall? (Boxers can avoid punches that are so fast they shouldn’t be able to – they have read the signals that precede the physical action). Highly skilled martial artists see these miniscule indications of intent, perhaps not consciously but at a deeper level they themselves cannot explain. Ki exercises are one way to enhance your natural abilities. Call it what you like, even magic if you will, but it does exist and can be trained. In conclusion; Ki, extension and relaxation = power. Ki – imagination – belief gives birth to power – the energy can become a reality. Like in the tai chi practitioner's knees or the finger joints in Tohei's exercise, the joints are open, relaxed – it is the space between that allows the 'magic' to travel. “In nothingness, there is everything.” You just need to ask your mind to take you there ! It’s only my opinion . . . but I’m happy with it . . . so far ! Richard Small December 2015 . . . and in 2017 it still seems correct to me. These are my own views, based upon the teachings of others and my own experience. It’s an amalgamation of eastern and western culture but which retains value for self and respect for others. I am of the opinion that to gain the most from your practice you are best bowing consciously, perhaps with a sense of both giving and of receiving. Strange as it may seem the act of kindness and its effects confer more power upon you than not. So in a way, kindness is unselfishly selfish. Respect the mat and the dojo, respect your teacher and partner and respect is returned. This is a good lesson for everyday life and in part this too is one of the great benefits of training in the art. There may be more than one reason for placing the hands together in ‘prayer’ position. Connecting hands in such a way connects left side of body with right side, making you naturally whole. It connects two major pressure points (nerve centres) in the palms together, one side being Yin and the other yang. It creates a balance of opposites and harmony. I read recently that the first of two claps is to connect outwardly, to send out your spirit to connect with the universal and that the second clap is inviting the universal to come and join with you. 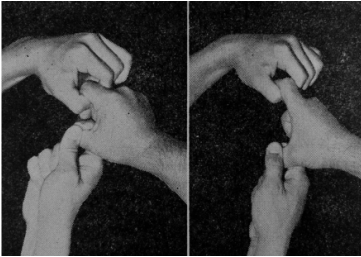 You can try this for yourself, I’d almost make a bet that you will find it very difficult to experience either the out or the in whilst making the clap. It is easier when your mind is quiet and the body not active. Whatever you chose to do and for whatever your reason you will still find it beneficial to have a purpose of good intent and to engage with it meaningfully. There is more to Aikido than technique ! I’ve chosen one verse from many; can it have meaning for you, a meaning that possibly is only for you. It is often the way, for to each of us the same something can appear quite different. This is my current interpretation. My feeling here is firstly that of an awareness or sense of Earth that holds me up (in your mind, stand not on the earth but let the earth push upwards, you will feel strangely lighter when you do this) and an indefinable concept of some on high celestial heaven, essentially a place in your mind that is above you. (Might just be a concept created by your own self from extending consciousness beyond self but feel a sense of connection with the top of your head, the crown chakra or celestial gate). Much of this ‘mind work’ is about creating mechanisms that in turn allow you to experience feelings that would otherwise be difficult to ever find. O-Sensei suggests ‘standing amidst’, so we can imagine heaven and earth as two separate entities and place ourselves between them. We then become the connection and become the bridge between heaven and earth. (You may feel a slight and involuntary elongation in your spine when you do this. Opening spaces within the body is a way of becoming one with the spaces in the universe – for they are the same). 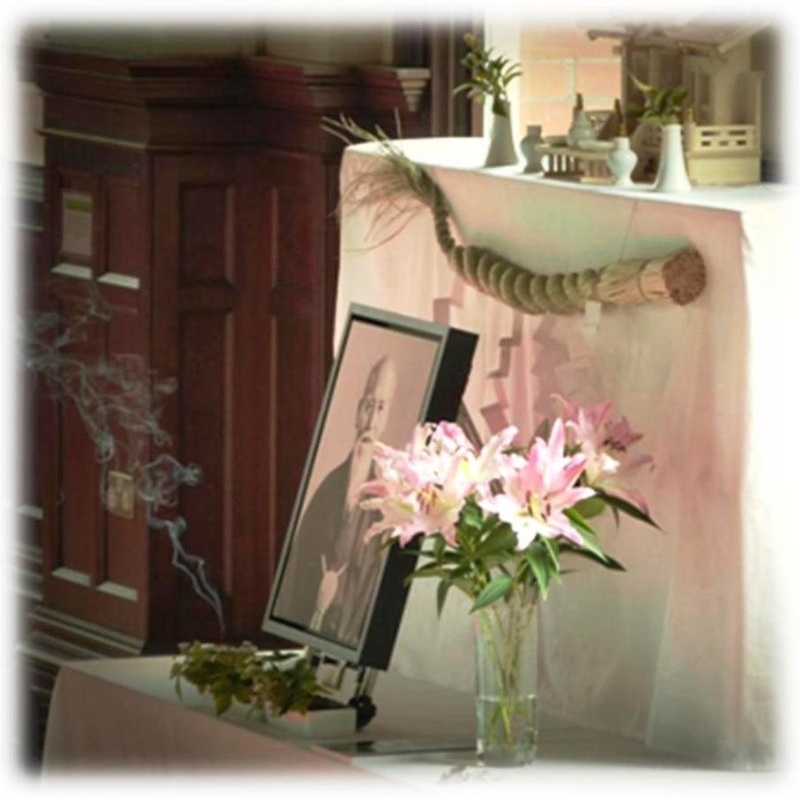 O-Sensei continues; ‘connecting with Ki’: imagine now your own consciousness, aura, Ki, life force, what ever you wish to call it, expanding in all directions, reaching out and as it does so touching the energies of everything around you . . . and as far out into the cosmos as you like, for your imagination is boundless. The ‘echo of all things’ is merely your awareness that you your own ‘Ki’ has touched and recognised the oneness in all it touches. Well, this is my interpretation at my current understanding. Perhaps if O-Sensei was here and I could understand him he might say, ‘total cobblers’ or perhaps ‘not bad, keep looking’. We will never know . . . or will we? Will stand a tip-toe when the day is named, And rouse him at the name of Crispian. Okay, so it’s a bit over the top but the sentiments remain true. What can we gain from a workshop or seminar that goes beyond our normal class? What can we give too? There are many gifts; the greatest is to yourself, then there is the support you give to the local teacher and the guest teacher, a support without which clubs would eventually fall into oblivion. . . so your gift includes the perpetuation of the art. There is the gift of your own knowledge, given without ego; the gift of friendship between strangers; the gift of joy in sharing O-Sensei’s art; the gift of question to the teacher who will learn from your question alone, whatever your level. Mainly we get as much as we are prepared to give, it is mutual. Without a training partner your quest is fruitless; as is a teacher without a student. What keeps us from attending workshops? Perhaps you have sound reasons why attendance is not possible and after all it is your life in which you must do your best for all. Perhaps you have darker reasons for not attending and they relate to your own problems and insecurities. Perhaps you should question the depth to which you follow O-Sensei’s ethics. I do. If you are annoyed by this then you probably don’t! I attended the 25th May Bukiwaza workshop hosted by Wellsprings Aikido in Dorset, taught by Sensei Paul McGlone of TIA Europe; the subject was 13 Jo Kata and associated awase. I was also honoured to be asked to teach at the Wellsprings Club Friday night class the night before the workshop. Teaching is one of the greatest tools to learning. . . you soon find out if you are in error. There were things I could show and those I could not, some of which I’d thought were fairly problem free. We specifically looked at the strengths and weaknesses of pins. . . but how wrong can you be when a 4th kyu so easily evades your pin. When I was younger and stronger I would have used just that to try and win but now I know I must find a path that is successful by other means. We need errors and failures; it is what shows us the truth of the matter and it is at the heart of our learning. If we don’t embrace challenge and step out of our comfort zone how can we ever progress except perhaps in our imagination. Later that evening I had a conversation with Sensei Mark about the subject of reality in Aikido and what constituted reality. It moved on to practical evasion from kihon; He gripped my wrist and I thought, ‘I know too much, I will move easily and he will be surprised’; the surprise was all mine as I couldn’t move. He explained that he was ‘cheating’ as he called it by making small changes to posture that countered my moving. Is that cheating? Is it not also a reality? I already have much to think about and we haven’t even started the Bukiwaza workshop yet. The day of the 13 Jo workshop. When we arrived at the venue, a really beautiful village sports facility bathed in sunshine, some students were already there and everyone happily helped to carry in what was needed; another gift, the joy of willing people sharing a task. Some students came late, an hour late. All the way from Reading the Bank holiday traffic had taken its toll on their travels; another gift arrives, understanding, empathy, sympathy, welcoming smiles. When asked by Sensei Mcglone, all present accepted that they already knew the 13 count Jo Kata, and we did too. . . our version of it anyway. We were asked to demonstrate as Sensei counted the moves. We received our first big correction after the very first move. Any guesses? You’ll have done it at some time and almost certainly will again! Don’t look down. . . your feet have been with you a long time, you shouldn’t need to look when you place the tip of the Jo on the ground. Of course, silly us, we knew that didn’t we? How annoying that we let ourselves down before we even started. We often ‘know’ something that we would correct in others and yet we fall into the same trap. . . this in itself is a giant learning point. Other corrections followed, accompanied by sound reasoning why it should be so. There are other ways but the logic of the method shown was indisputable, so lots of room for thought again. There was much emphasis on blending. . . . ah yes we know that too . . . but this was deeper than we had thought to go. It was about connecting, sensing breath, energy and intention in your partner so that you effect a true harmony and not just blend to escape. If anything it was blend to become one. Most notably in the 2nd move of the kata awase, using their energy to drive the movement of high speed turn and strike. No wasted foot movements that rob you of time, everything efficiently executed. 3rd tsuki from your partner is not blocked and almost not parried either, just softly blended and deflected. I’d been working for several months on a powerful counter deflection prior to completing the tsuki but Sensei McGlone’s version didn’t do this it merely changed direction and was easily lined up for the finishing tsuki. There were many such enlightenments, all of which were ably demonstrated with accompanying explanation; though it was not needed as the effectiveness of the demonstration was evident. Key points? True blending at a deeper level, awareness, no wasted movements, know when and how to move off line as necessary, blend with the partner’s energy. . . engage with it and use it to power your own sense of movement. For me it was a wonderful weekend with the blessings of fine weather, good food, great friends and good teaching. 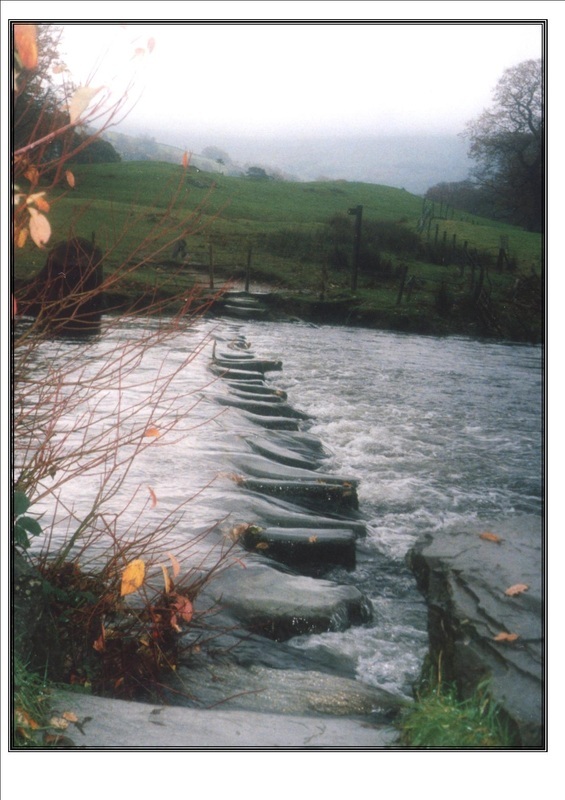 . . it enabled me the privilege of several more steps on the spiritual pathway. What can you get from attending a workshop? Everything, absolutely everything, just keep an open mind about you. There are more bukiwaza workshops to come at Wellsprings and DVD copies are available too. However, you simply cannot beat, being there! In no particular order the following are a sample of the admirable qualities to be gained in the pursuit of a martial art. humour; co-ordination, (of mind and body); flexibility; intuition. These are transferable skills that will serve you well in life. They are yours for the having, if you so wish. Regardless of style, how often will you have heard the advice, ’extend’, whether it be to extend ki or merely to reach out physically? When you extend ki there will always be an unintentional and often unrealised slight physical extension anyway; it is better to think of it in an energy way rather than extending only physically for that can lead to tightening of muscles and locking of one’s own joints. If you observe any of the great masters their ‘extension’ is evident, it is clearly visible. 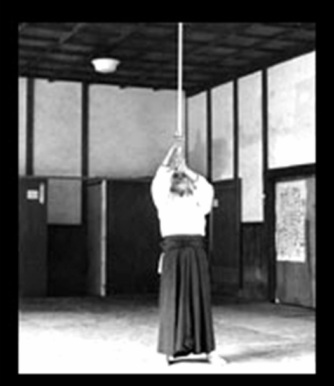 Old film of O-Sensei shows his extension energetically and physically. So let us presume this is an essential part of the art we follow. How do you use your Aiki weapons? Do you extend your mind into the weapons? Do you reach out, keeping joints relaxed but open? Do you maintain good connection, not only with you and the Jo but with your arms and the rest of your body? Are you relaxed and yet focussed (concentrated) in your movements? Is the grip you have, relaxed, connected and effective? Do you keep the Jo (weapon) in harmony with your body? Explore an idea; Try any weapons move you know. . . preferably very slowly, and consider the relationship with yourself and the Jo at all times during the move. Is your own action causing your joints to be stressed? A common example is in high Tsuki, if the hand is too far away from your body there is a tendency for the fingers to be wrenched open … Aikido isn’t meant to self inflict damage to your own body ! Hands should always be able to retain a relaxed grip; this allows the shoulders to relax too. If it doesn’t feel right then it probably isn’t. Using the mind to extend Ki does not mean that any of your joints are locked nor your muscles tight. . . a controlled relaxation is the result. In the high tsuki mentioned earlier the arm may be bent but there is a sense of opening and reaching out which gives it its power. . . it is truly connected and at one with the whole body. 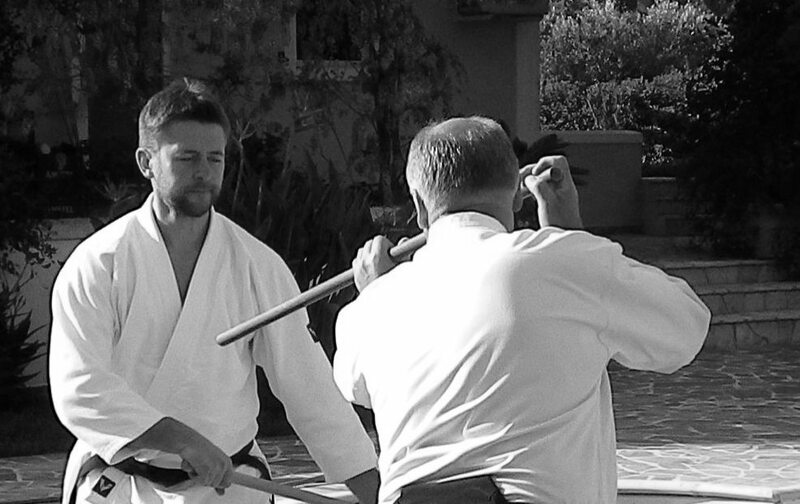 It is my view that extending Ki is an essence in weapons work and therefore can develop that principle into a natural habit available to you in all your Aikido. Sensei Sargeant in high tsuki in 13 kata. Note expression of energy in addition to front hand position. Sensei Stoliarov assisting. The essence of kokyo dosa ... connection, extension, ki. Once at an Aikido seminar the quiet of lunch time was broken by the heavy click clack sound of Jo on Jo; at the far end of the dojo a man wearing a hakama energetically jousted with a kyu grade on the 31 partner practice. Nothing conflicts with etiquette about training in your lunchtime but let’s ask what does conflict with etiquette and indeed the high value principles of Aikido to which we all say we aspire? Firstly, we should question why there is so much noise involved with Jo on Jo. Is it that we are trying too hard? Do we want every one to turn their heads and admire our skills? Is it that we ‘want to win’ too much? Is it our ego that drives this desire? 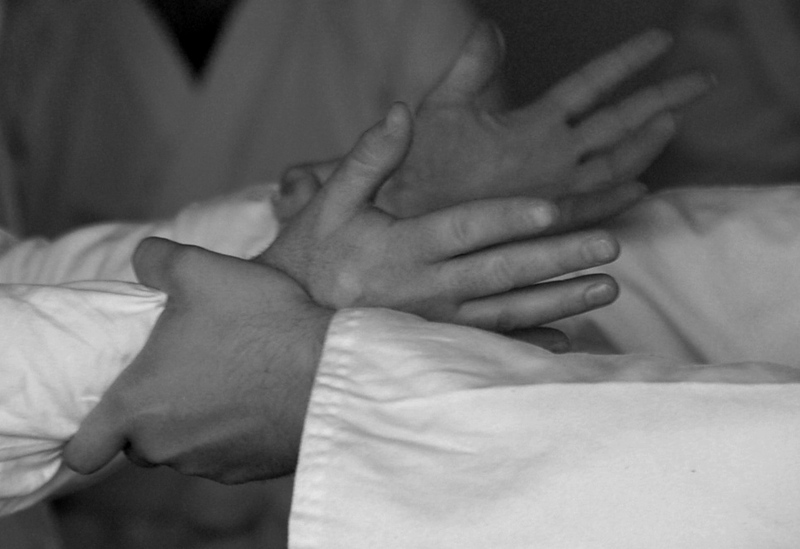 If we are practising Aikido shouldn’t one of the principles be to first escape an attack and secondly to blend with it, taking the attacker’s mind or body, or both, prior to completing the appropriate technique in a peaceful and harmonious way. It is from the latter that great power comes and not the weakness that we normally associate, hence we normally put in too much strength, thinking that connected relaxation could never be enough. . . but it is. Secondly, whose Jo were they using? You’ve guessed the answer by recognising the question, it wasn’t their own. Now this is bad etiquette, you should never use another persons weapons without gaining permission. . . will you buy them another if you damage it? (Especially if you are going to practice in a harsh and foolish manner). Once again it may be our old enemy, Ego, that thinks we are more important than another and that our importance overrides etiquette. So, consider on your path of Aiki what is of true value on your way, if you have to pick up someone else’s Jo use it to beat your own Ego out of yourself . . . otherwise leave it alone, it is very bad etiquette. Even the apology afterwards is insufficient, and the absence of one should speak volumes. Written in the spirit of education. . . and just a little ego !! My soul didn’t ask me to write this, it demanded it of me. The trouble is the language of the soul doesn’t translate very well into English and concepts exist that find no words in our language. However, I shall do my best, which is probably what you do too. . . or at least that's what we often say we do, don’t we? Poor old O’Sensei, he had such a noble dream to reconcile the world in peace through Aikido. It might just be possible if we all tried harder for that goal. I am minded of a story about two birds discussing falling snow and its weight; one said, “snow is so light, it weighs nothing, why I have seen it lifted in the wind.” The other replied, “I think not friend, for I once watched snow landing on a mighty tree branch, snow flake after snow flake landed and the branch held strong . . . until just one single snowflake more landed and that branch was felled. . . just one tiny snowflake was all it took.” The moral being perhaps that in life situations we can be that outwardly insignificant thing that finally tips the balance. But I digress, the soul wants me to write of other things; to question why we might do Aikido, what qualities do we seek. . . if at all, what teachers we might follow, who do we think should be practising Aikido or not, more importantly; who or what do we aspire to, who to emulate, who to cast aside. Are they not all snowflakes? If none of this means anything to your own soul please don’t read anymore, go and do something that you think is more important. It’s your soul that matters and not the calculating, time constrained egoic left side of your brain; you know, the side that just looked at how many more lines there are to read, or the clock, or thought about a snack, or what’s on TV, or ‘who does this bloke think he is?’ It’s the side of the brain that will let you down one day when it decides it doesn’t know the answer. . . an answer that your soul knew from birth but you don’t listen. When we are young, lots of not so old people actually look really old to us and we foolishly look down on them, seeing them as less able or defective in some way that we of course are not. I learned a lesson many years ago for which I remain grateful. I had not been practising Aikido that long but had risen to the dizzy heights of yellow belt where I was at one with the universe! My teacher at the time, Sensei Aubrey Smith, had organised a workshop with a visiting teacher at our small dojo in Wellingbrough. 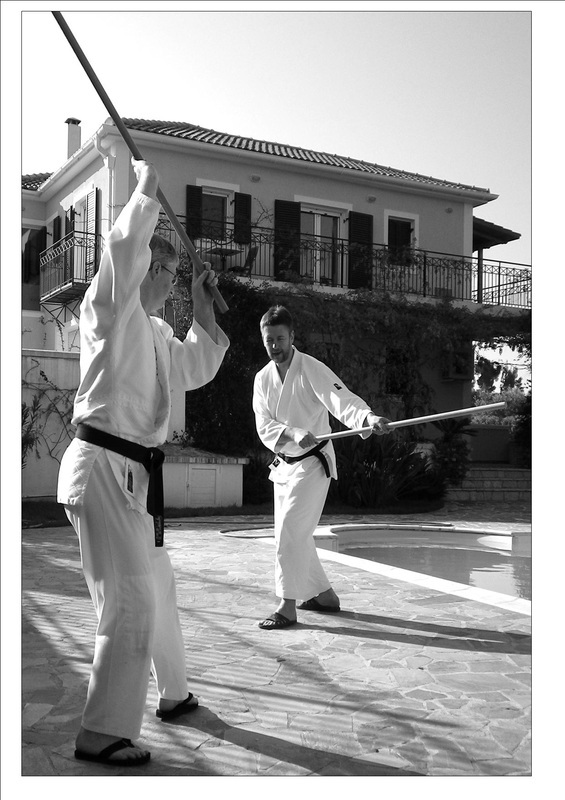 I sat on a chair in the dojo along with another yellow belt, I think his name was Mick, a swimming instructor he was. We were waiting for a few more to turn up when this seemingly short and elderly chap came in and put a briefcase down on a chair before leaving the room again. Mick and I looked at each other; we were amazed that this little old chap (as we saw him from our twenty year old eyes) was going to attempt Aikido. Didn't he realise it was a martial art and required youth and strength to perform. . . why, he was just wasting his time, he might get hurt. Our Sensei entered the dojo and we lined up ready for the start; the visiting teacher entered and we were totally gob-smacked that it was the old chap we had written off before. He was a second dan at the time and we know of him now as 8th dan Sensei Pat Stratford. I was to meet Sensei Pat again when we travelled to his club in Coventry where he hosted a course with Sensei Andre Noquet of France . . . another old man, (from our twenty year old eyes). Please realise that I write with affection and respect for these masters, past and present. I may not remember the techniques but I remember the men and the lessons I learned and I have gratitude for their unstinting devotion to the art and to the efforts they made to share it. I also recall an elderly dan grade who trained with us in Cambridge; it was annoying if I found that he was my partner because I couldn't throw him about and inflict my 'Aikido' on him like with a younger 'proper' uke. How sad that we can practice an art about which we often understand nothing. It shouldn't have mattered about his age, it is not up to uke to develop our Aikido but it is up to us; another valuable lesson from the 'has-beens' as we so foolishly think them. O'Sensei was an old man, why don't we discount him too, or perhaps you have. There are a few of these older chaps about and so often they have little publicity and fewer students, a handful at most. Many students want a dynamic teacher, a Bruce Lee type, not someone who looks like they live in an old people's home. They choose a teacher that fits their mind set and what they think they want from Aikido; yet that too will change in them with the changing years . . . if they keep going that is, for many will abandon the art when it no longer suits their ageing body. The art will never abandon us; it is only we that are guilty of that deed. The older teacher probably has all the answers to which the younger student, or even teacher, hasn't even discovered the questions. Whatever we do in life, much of it will have depended on the help of others. . . you'd be dead now if your parents hadn't fed and looked after you, you don't make your own clothes you probably don't gather your own food, you wouldn't be reading this if someone hadn't taken the time and trouble to help and guide you. You think you did it all yourself? Then you suffer from another problem that martial arts should have helped you with. . . ego, let's make that Ego. O'Sensei wrote about taking the sword and cutting down the enemy. And where did he suggest we would meet this enemy? Inside, of course. What form did O'Sensei suggest this enemy would take? I'm not sure that he extrapolated on his suggestion but I would hazard a guess that it wasn't anything on the following list; loyalty, honour, integrity, gratitude, patience, endurance, tenacity, compassion, generosity, understanding, harmony, spirit, in fact harmony of spirit through our endeavours. I nearly wrote some more there, but have deleted it when I realised it was not my soul but my thinking brain that wanted to say it and there is no place here for such thoughts. I will close by thanking all my teachers whoever they were or are, in life or in death, some gem of wisdom has stayed with me from each and every one, I am grateful for all the efforts they made in the search of their art and their willingness to share it freely. Let wisdom be the hero for the day. . . . for a change. In Wudang mountain a Taoist monk once said to the visiting students, “seeing is not seeing.” In that fortunately receptive moment I understood what he meant. Illusion; almost all is illusion, all colour that we see is not real, it is an illusion created by our mind so that we can distinguish our environment. Our sight is illusion too in that the ‘blind spot’ that we all have in our eyes cannot be found by trying to find it in the space in front of us. The brain knows that something should be there and creates an image that fills the blind spot. The blind spot has disappeared from our vision. When you look in the mirror you rarely see yourself as you really are, you see an image that is your perception of who you think you are. Magician’s work their magic and make things disappear in front of our eyes; it is a trick, our mind sees what it thinks the eyes have seen and if the eyes have missed something, then the brain just makes something up that fits. I read somewhere O- Sensei seemed to disappear when attacked, much to the surprise of the attacker. Note that to the observer nothing of the sort seemed to happen, therefore we can presume that it has something to do with the impression felt by the attacker alone. My own novice view is that this surprise was multi layered. Let’s consider the implications for our own learning if we want to emulate O-Sensei’s skills. What he did, we may never know. What he might have done, we can explore. Perhaps Uke is distracted; by a movement across his eye-line. A 'temporary blinding' either because their sight is obstructed or that their eyes followed the movement and took their mind with it; if their mind has gone from where nage was and followed something else … then has nage ‘disappeared’? Eyes are an essential component of your power, your ability and your understanding. We can test this easily by pushing on someone who stands in good posture and whose eyes are looking forward, yet when they look down they are more easily moved. . . their eyes and their intention are no longer one with their body. The next thing to consider is the simple physical level. This is where you don't visually disappear but physically you feel like you have to the Uke. Uke directs a force towards Nage and makes contact, this satisfies Uke that his purpose is being fulfilled. . . as long as certain criteria are met by Nage that is. Retaining the point of contact Nage can withdraw his body and neutralise the force. Neutralise is the better description than deflect or avoid or any other word that you might substitute. Uke's body experience is that everything is alright and going to plan, Uke has put the force exactly where they wanted and it has not been interfered with, therefore they continue with what to the observer is a senseless strike. . . however, Uke’s eyes tell a different tale, all has gone wrong, they have missed their target. Their target is no longer where they thought it was, it has 'disappeared'. The strange thing is we trust our body more than our eyes and the Uke inexplicably continues to apply force in their chosen direction; Uke cannot feel any hard resistance but is aware that there is still 'something' inexplicably tangible there to push; so they do, to no avail. For Nage's part they have retained a passive presence at the point of contact while being active in moving the rest of their body, storing their own power as they do so. Nage is active in setting up their own posture and energy to advantage at the same time as Uke’s attack is failing. Perhaps O- Sensei had surpassed these methods and was using an ‘energy’ level technique. We shouldn’t really call it technique either as it is closer to ‘magic; something few understand but at which many marvel. The placing of one’s mind outside the body can create a tangible, if subtle, presence which influences something in another person. Isn’t this the ‘Ki’ in Aikido? O- Sensei said that he was aware that these things happened but could not explain it. It is not really something anyone can explain or intellectualise, simply something that you ‘know’ exists when you ‘experience’ it. My own valued and respected teacher, Sensei Tony Sargeant is not only a dedicated student of O- Sensei’s Aikido but has studied Tai Chi, Yoga, Healing Arts and Meditation. All of these can open portals of understanding through personal experience. During training sessions, when Sensei Tony offered his arm up to uke (initiating) it was almost impossible not to reach out to grab or push it. As soon as you did his arm seemed to disappear leaving a hole in space into which you were drawn. As many of you will know, this is no easy task to accomplish; try it. It was many years ago when I experienced this and to this day I cannot achieve it myself. I am beginning to think that Ki is real, it has a tangible existence, it can be felt, experienced, sensed, it can be used to influence others. This is such a difficult subject to write about mainly because of my limited ability and knowledge. . . but it’s not going to stop me trying and perhaps you will know it better. You need to be able to shift your consciousness around and out of your body. Koichi Tohei’s exercise using the Jo is an excellent example. With a partner in Tsuki No Kamae hold the end of the Jo with only a light grip and put your spirit into the far end of the Jo, the end that your partner is holding. The difference between spirit close to you and spirit extended away from you is great. You can test this for yourself. Practice putting your consciousness elsewhere in the body, eg the ball of the foot, or the palm of the hand. Control over transferring consciousness is used in pain relief. You twist a toe on the mat. . . you can keep your mind on the toe and all its pain or shift your consciousness to eg palm of the hand or to your hara or centre. Not easy, so you need practice. Meditation can assist you in such control. The pain disappears ! It is as if it were not there. Herein lays the clue to what we need to do in order to disappear. I just hope you can find a way through these ramblings to an understanding which will be of value to you. Try and think this way. . . there is no such thing as imagination. . . everything is real. Whatever you ‘imagine’ exists, does exist. To feel the subtlety of Ki try this exercise. Ask a partner to place their hand on your arm near the shoulder. They should push only lightly but steady. Stand relaxed but with life. Put your consciousness in your head behind the third eye, sense that this place opens and becomes alive. Move to the heart area and do the same thing with your consciousness, keep both centres open and alive. Now move to the Hara or centre, bring that consciousness here too, open and alive, keeping all three points open and alive. . . . it is all you think about . . no wonderings, no doubts just stick to what you have been asked to do. Your partner who is applying the gentle push should feel like you at first ‘disappeared’ or at least became softer, and then they should feel like their whole body is gently and subtly being moved away from you. When you are one with the universal, the universal will help you. In the ken partner practice of Ki Musubi No Tachi, as the attacker lifts to strike for the second time there is a point during which they are unsighted from your ken. You then enter in migi hamni with Tsuki to their chest. If you have the timing correct it is they who expose your ken to their awareness as they lift their ken. It appears, giving them a surprise which you can see reflected in their startled body language; my point is that there are things that appear and disappear and it is this phenomena we could use to advantage. . . if we have the skill. The mind is nearly everything in this matter; that and the perfect timing born of good training. Note: like all good minds mine is susceptible to change and since talking to my teacher I realise that there is much more to discover about this subject. The answers do not reside in the writings above but they are at least steps on the way and sometimes they are steps you must take to get to the other side. My mention of Ki Musubi No Tachi is flawed in my thinking. If I understood it better I would tell you. Somethings remain a mystery a bit longer !! And in 2017 it still is !! the inflation of your successes. The middle way is calm and relaxed. prevents you crossing to a better place. for it is they that might guide you the better. 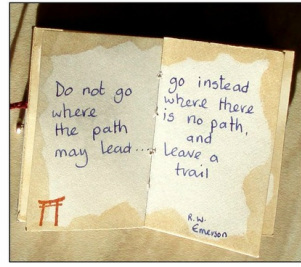 You are on the right page, the right path, if you see the importance of 'mind'. There must always be opposites, everything exists because there is an opposite. The opposition can be physical or it can be a combination of physical and mental. All these things you can test for yourself, you need believe no one other than yourself. There is so much paradox but between the extremes is the answer and therein you'll find peace and power. When you are at peace fear has no power over you. When all your teachers told you to be 'centred', what did they mean? Could it be as shown here? Learn from the experience of your own investigation. “In nothingness, there is everything”. Ki . . . Imagination. . . belief gives birth to power . . . the energy can become a reality. Extension with relaxation enables the body to unite as a whole, leading to greater power. The power is in the joints – in the space between them. Just like the space in a wall is the gateway to another place. If you are familiar with the ‘unbendable arm exercise’ you will recognise this. The space between contains opposites which work in harmony to create a whole. When relaxing you should feel a quiet, calm expansion in the joints, the mind is drawn to outside of the body rather than within and the sensation of weight on the body becomes lifted so as the feeling of having joints disappears. Testing, competing with, and criticizing others, weakens and defeats you." rather than be as the Japanese say, suisei-mushi, to be born drunk and die still dreaming. Weld yourself to heaven and earth and unify practice and enlightenment. soul of a warrior, enlightened wisdom, and deep calm. let us think upon it for a while? What is it that he felt. . . what is it that he discovered? "In Aikido, the other is present but, at the same time, is not. If one simply moves according to the motions of one ' s everyday practice strangely enough, the other moves in the same manner. In this way, all one has to do is to execute techniques as one does normally during daily training and one's partner will naturally follow along. This is the mystery of what is called Aikido. For instance, anyone should be able to move people with just one finger. The strength of man is limited to the circle within which we are located as the center. circle. Everything is decided when, by continuously moving in circles while shifting the center to within one's own circle, the other is led outside of his own circle." The use of 'mind' is essential to our progress on the path to being one with the universal, which is why I have quoted from O-Sensei's memoirs above. As I pasted the quote I began to think I would never understand it . . . however I think now I do . . . can I perform this in action? No, definitely not. Will I get there one day? Somehow I doubt it very much, but I will retain the pleasure of the understanding. Here are a few thoughts written by me in 2007. I’ve always been fascinated by O-Sensei’s ability to hold off a push on the forehead whilst seated.in seiza. When the opportunity arises to ask one who might understand this, I take it. From the Chinese Master, Ren Gang … 'your generous and spiritual energy field reaches out, in connection with the other, and becoming one, you empty out, and being empty there is nothing left for them to push'. Perhaps this is the answer I sought. . It seems that we have to move to energy levels and leave dependence on the physical behind ….. difficult! Even applying intention itself may be felt by another, therefore use the words, ‘I am interested in doing this’; it is different and feels different, with even less information being passed to another. Both keep you relaxed and yet safe, both make it effortless and allow speedy recovery … because you never stopped and you are also still on line to their centre. Neither have the presence of the idea of 'opponent', both require the 'mind' to be the active component. I just hope that this makes sense to you, the reader too, if not, there is always the contact page for your views. Many things will appear contradictory ..... they are an essential part of our universe, without opposites we are dead. (try only breathing out if you don't believe me.) We hope to make sense of them when further down our path. Keep your mind on the flow of Ki .... use your imagination, visualise. The Ki should flow calmly and naturally and so move the entire body smoothly and continuously. The spirit is at ease and the body quiet. In every movement you must be totally conscious. Faced with the enemy think not of them or their weapons, be forgetful of all technique, be ready to follow the dictates of the unconscious , when you strike it is not the man but the hand of the unconscious that strikes. The analytical or thinking mind is dangerous, for the mind must be flowing. A stopped mind is injurious. By being still and quiet silent messages of your opponent's movements may be revealed to you. Consider this, "by paying attention to your ki and not your breathing, your striking force will be as strong as steel. If you pay attention only to your breathing, your blood circulation will be impeded and your striking force will be inactive and ineffective" , according to a Ming Dynasty Tai Chi master, Wang Chung Tueh. "By paying attention to the subtle ki the resulting movements would be like the incessant flow of a great river, with 'all parts of the body connected like a string of pearls'." Consider how this fits with your own training and practice ... or not. 'The martial artist should be in tune with natural law. In appearance like the eagle about to catch the rabbit; internallly his spirit like the cat watching the mouse; at rest, like the mountain, in movement like the river'. Beware over extending, becoming full, for the maximising of anything can only result in decline. All empires fail in the end. Therefore a cyclical approach to extending energy is best, always retaining some power in reserve. The study of yin and yang will bear self evident proof. Sudden moves end in sudden stops. Better to have continuity of movement, whereby you can remain centred and calm yet fluid like can move at will in a direction of your choice. Sudden or awkward movements stifle the flow of Ki. Avoid being double weighted, allow your centre of gravity to be displaced and therefore hidden from your adversary. The idea of circles and spirals is to be examined and exploited to your benefit. Visualise the flow of Ki, within self , and in the wider universe. The mind itself plays its part in securing calmness and tranquility, without which your stored Ki cannot flow freely. 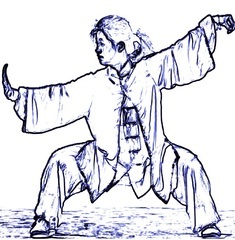 Never become disconnected from the flow of Ki, do not leave gaps and at each opportunity store your energy like the archer draws his bow. For Ki to flow your body needs must be relaxed yet knowingly alive and connected. It is not just the body that should return to the pliability., suppleness and free flowing state of the infant but that the mind too should change state. The aim is to have no preconceptions, be non judgemental and without plans ...... merely let the mind engage in the moment as it occurs within the larger universe. Sensei Michael (left) and Sensei Sergei (Right) working on 13 Jo kata partner practice. Although the above expression is found in the Chinese art of Tai Chi Chuan, it would appear to have value in most other activities too. O-Sensei used the term 'yang' in his memoirs; His understanding of the way of the univese . . . which can only exist because of opposites, commands respect. If at any time everything stops then you are vulnerable . . however , if your body stops but your mind continues then you have an opposite . . . a Yin and a Yang - a passive and an active. I suggest to you that at the end of any movement you should seek an energetic continuation even if the body would appear to have stopped. The Energetic continuation will however be connecting with muscles and pathways in the brain and preparing for the next move. Your mind precedes the body, and you might like to consider if this is so for breath too.